From CNN Senior Congressional Correspondent Dana Bash, Romney's debate prep sessions lasted 2.5 hours long--an hour longer than the 90 minutes scheduled for the showdown. Tight rules at tonight's debate: Six 15 minute segments; the first three segments will focus on the economy, then healthcare, the role of government and governing. But will the candidate follow the rules? Earlier today, John King wrote what the debate was "all about" - trust. I'd trust him - he knows these things. The SNL parody of this should be great. According to the Romney campaign, the GOP presidential nominee had his pre-debate meal at the Cheesecake Factory with his wife Ann, four of his sons and a few grandkids. Romney and his motorcade have departed his hotel, now headed to the debate site in Denver. How would the candidates handle the federal debt? According to the press pool report, Romney and motorcade are en route to the debate site. Former Massachusetts Treasurer Shannon O'Brien tells CNN about her experience debating Mitt Romney. 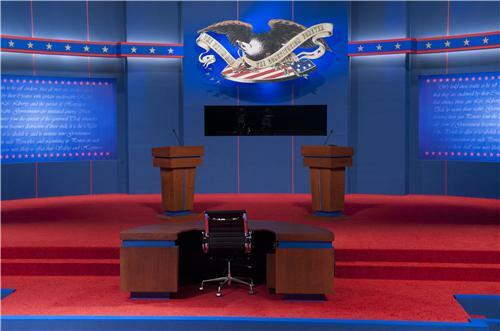 Do you think tonight's presidential debate will be a game changer? Are you open to being persuaded by either candidate or is your vote locked in for Election Day? i'm with u MT @AriFleischer: Here's what I'm looking for. A Romney win;for the Yanks 2beat the Red Sox. take an Orioles and Obama loss. Don't expect to hear applause tonight as we heard during the GOP primary debates earlier this year. Moderator Jim Lehrer runs through the ground rules for participants in the hall, stressing the importance of "absolutely silence." "If you hear something that's really terrific, sit on it. If you hear something you don't like, sit on it," he says, asking the candidates' spouses to enforce this rule. but adds, "Have fun!" RT @DylanByers: Jim Lehrer calls for "wonderful, serious, delightful silence." Romney says Obama would bring "trickle down government" in new term. That my friends is a zinger. Romney opens with a story of a family who lost their home and jobs, then transitions to his five point economic plan and criticizes Obama. "I'm concerned that the path we've been on has been unsuccessful," he says of Obama. Just a reminder if you're finding us somewhere other than CNN.com/Debates - you can go there, cut your own clips while you watch CNN on TV! i love it. Mitt goes "trickle down govt"! 16 trillion of that and it's not working so good! Obama says he wants to improve the education system, hire 100,000 new math and science teachers, and promote more job training at community colleges. As we look at Twitter, "zinger" seems to be the most tweeted word. Invited to ask a question of Obama, Romney fires back at the president's charges that Romney's plans include a $5 trillion tax cut. Obama spends most of the criticism looking downwards towards the podium, while Romney is looking towards Obama. Romney: Middle class has been buried. h/t Joe Biden. Correct Maggie and Anthony - thanks for answering. We've got more trivia coming up soon. Romney says he would lower credits, deductions, and exemptions to pay for his tax cuts. This will get more attn tonight.